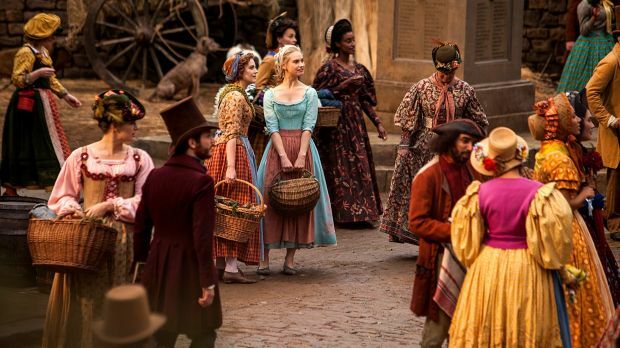 The new Cinderella is a fantastic retelling of the classic fairytale that closely resembles the animated version, while still adding more depth and beauty to the story than ever before. 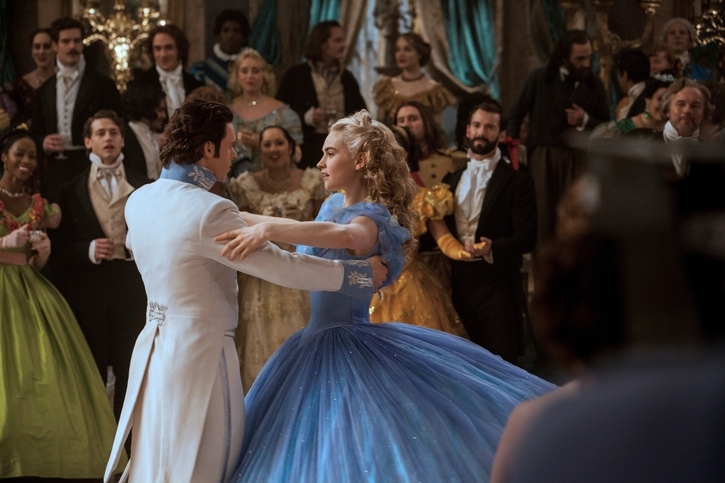 Here are the top nine reasons that you should go see the new version of Disney’s Cinderella. The visual designers did a wonderful job creating a world of fantasy that doesn’t look too computerized. There is nothing worse than being immersed in a beautiful story and then being yanked out of it by poor computer graphics. This is not the case in Cinderella. Sweeping long shots are combined with rich set design to create a fairytale world that looks so real we could almost step from the theater onto the dirt road. Each actor was perfectly cast to enhance the story. 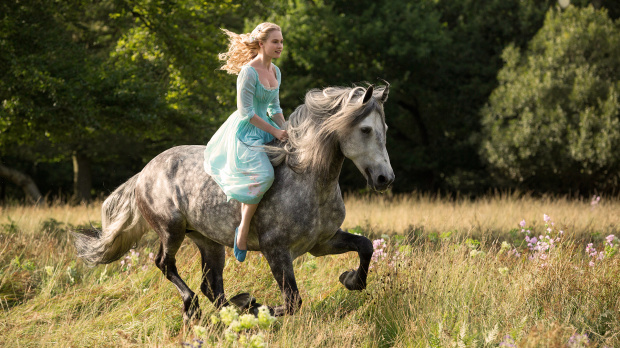 Lily James as Cinderella brings a sense of innocence and place to the character. Richard Madden helped to add character to the usually dull Prince Charming. 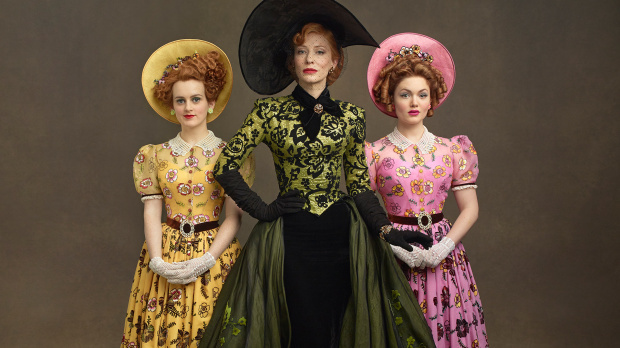 The real win was the acting by Cate Blanchett who played the Evil Step-Mother, Lady Tremaine, absolutely wonderfully. Fans of the original animated classic will really enjoy this new version. The script for the new movie is based on the 1634 story of Cendrillon by Charles Perrault. As the animated movie and this new version share the same source material, a majority of scenes are very similar, but the new live action film is able to go more in depth on certain pieces from the original story. One of the plot points that was expanded upon is how Ella became Cinderella and how she lost her mother, father, and servant friends. We finally have the entire picture painted for us that explains how the beautiful blonde girl ends up sleeping by the fire, talking to mice, while serving her step mother and step sisters. With the added details about Cinderella’s backstory came new details of why the stepmother is just so evil. For the first time, we don’t just see the way things are, we see WHY things are the way they are. Throughout the new film, Ella reminds herself of the words her mother taught her. This saying is “have courage, and be kind.” This is the driving slogan for Ella’s continued happiness throughout the film and provides a string that nicely connects the story. When I first heard it, I couldn’t stop thinking of this scene from The Help. When the prince first meets Ella, she isn’t in a beautiful ball gown. Ella is running away from her step family in her dirtiest work clothes and has ashes all over her face. I think it is safe to say that the prince doesn’t fall in love with her specifically for her beauty. The director successfully used this interaction to add depth to the love that Prince Charming finds for Cinderella. He loves her for her sayings of “have courage and be kind” and for her attitude. Being a young guy, I don’t consider myself to know fashion. 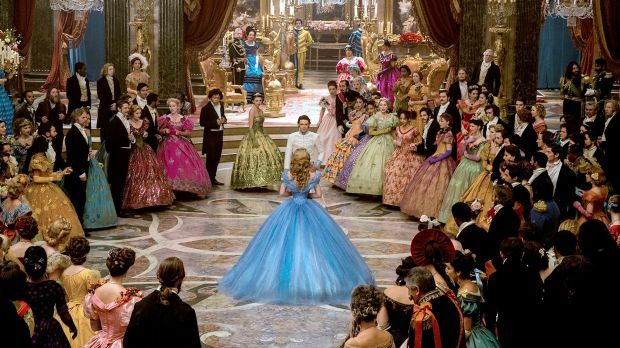 But, even I can tell you that I was wowed by the incredible costumes used throughout film whether it was the dress of the evil stepmother or the live action version of the incredible blue ball gown worn by Cinderella. A recent article by Babes in Disneyland has me even more interested in the costumes. I’m making today a perfect day for you! 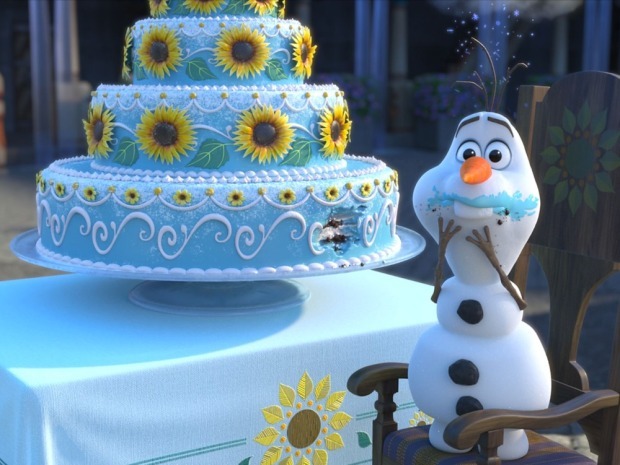 The new song from the Frozen Fever short that debuted before Cinderella is now stuck in my head. This short was a nice trip back into Arendelle that lasted just long enough to get everyone excited for Frozen 2, which was recently announced. My one personal quip was the use of Helena Bonham Carter as the fairy godmother. I would have preferred someone who was more grandmotherly and resembled the character from the original film a little more. Aside from this small criticism (back seat directing, if you will) there is very little for me to complain about. In the next coming years we should expect to see even more of this type of retelling of classics from Disney and other studios. This version of Cinderella was a fantastic dusting off of the source material, and if that is the plan for all of the upcoming retellings of classics, I am quite excited indeed. You should see this movie if you enjoy the classic Disney animated films, want a magical escape for a couple of hours, or would like a change of pace from the blood-filled flicks that seem to constantly fill the theaters. 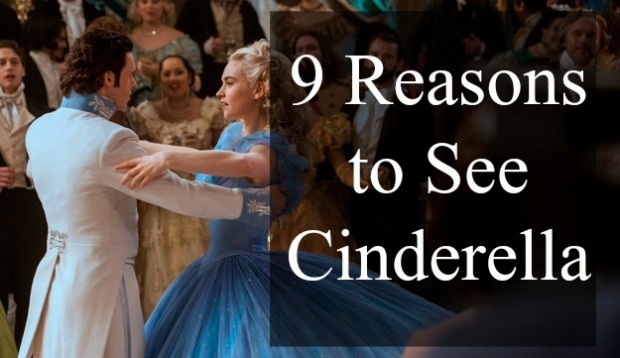 I am very happy to have seen Cinderella and recommend the film. For more from DisneyDose.com, be sure to join our newsletter and like our Facebook page. And I have to say, any Disney fan who does not like Frozen is pretty cold-hearted (no pun intended) and is perhaps being pretty unfair. At the end of the day, if one nitpicks hard enough, *every* Disney animated film has flaws. That is a fact. I don’t care what anyone says, Frozen is a fantastic film, and I am glad that it has been such a success for Disney. I am very intrigued that a sequel is officially in development. Sequels are not necessarily a bad thing, and with John Lasseter in charge, I know that every project is made with quality-and good intentions-in mind. On that note, if anyone is concerned about the prospect of a sequel, I would recommend that you to write a letter to Disney Animation and let the directors and producers know how much the film means to you, why you enjoyed it, and to wish them luck. This is Disney’s biggest hit since The Lion King and they need to proceed carefully. 🙂 Their mailing address can be found at the Disney Animation website. Thanks for the comment Fred. Very well said. Frozen is a fantastic film and each time I think of it, I can’t help but sing one of the incredible tunes. Anyone with comments regarding any practice should not be afraid to write a letter to the company(or online note). Hope that you enjoyed my comments at the shareholders meeting. I was excited to be in attendance. I enjoyed Cinderella. A very pleasant film. I was glad that it was not a rehash, I liked how it has some elements that are different from the 1950 animated film. And I really enjoyed Frozen Fever. It was great to see these characters on the big screen again. On that note, my sister and I were at the 2013 D23 Expo (we’ve actually been to every D23 Expo) and saw Idina Menzel performed “Let it Go” live on stage. It was awesome! Frozen was well represented at the Disney Animation pavilion, but no one could have foreseen what a surprise and success the film would become! I had that same experience seeing Idina Menzel. Now, looking back on the expo, I can’t believe how popular the film and song specifically have become. Thanks very much Chris. Glad that you enjoy the site, and that my mom(my biggest fan) is sending some more people our way.